In an exclusive interview with Prof. Summers and Prof. Edmund Phelps, Thought Economics looks at the story of modern capitalism, the benefits it has brought, and the challenges it has created. The series explores the ‘post crisis’ economy, the role of government in society, the relationship between capitalism, conflict and inequality and looks at what needs to be done to ‘fix’ our global economy, and the science of economics itself. Nobel Prize Winning Economist, Edmund Phelps is Director of the Columbia University Center on Capitalism & Society and the McVickar Professor of Political Economy at Columbia University and Professor Lawrence H. Summers is the Charles W. Eliot University Professor and President Emeritus at Harvard University. He served as the 71st Secretary of the Treasury for President Clinton and the Director of the National Economic Council for President Obama. [Edmund Phelps] As a matter of history it’s crucial to distinguish between what I have taken to call ‘mercantile capitalism’ and what I like to call ‘modern capitalism’. Mercantile capitalism I think of as prevailing in Britain, Holland, Spain and elsewhere from around 1500 to 1800 or so. The American colonies were, of course, part of that. Following this, thanks to a number of antecedent developments; political and economic- by the early years of the nineteenth century, Britain was able to put all the ‘bricks in place’ for a prototype of modern-capitalism that launched with the end of the Napoleonic wars in around 1815. Then I see America as joining that list in around 1830… and one must give recognition to France within this story- even though they never became as strong an example as Britain and America. In the 1860’s and 70’s, Germany joined the group- and things began to become complex. Fundamentally, modern capitalism was a system for indigenous innovation- while mercantile capitalism didn’t have much innovation at all. Perhaps more importantly- the innovations that did occur during the mercantile period were, in essence, applications of scientific and navigational discoveries outside the economic system. What was striking about the modern economies is that they were internally creative. I don’t just mean creative in the sense that you may refer to an individual’s potential creativity before they have done anything… I mean that they [participants in modern capitalism] actually delivered. They delivered new products and new methods with stunning frequency- ultimately every day! This occurred right through the early nineteenth century, and some countries went through this journey again- the United States, for example- during the inter-war period between around 1921 and 1941- it was an extraordinary time. This happened again between 1955 and 1975 and then disquieting things began to develop. Q: What have been the greatest benefits to society from free-market capitalism? [Prof. Larry H. Summers] There have been no engines of human progress that have been nearly as effective as freedom, markets and technological-progress. People today live longer, richer, safer and more fulfilling lives than they did hundreds of years ago, and they did three hundred ago, and so on. The reason for this is the progress that has been inextricably intertwined with market-based systems. That does not mean that markets do not need to be supplemented, monitored, regulated and stimulated. Nor does it deny the fundamental importance of non-market institutions, of which the most important is the family. But… as a way of organising the production and distribution of goods and services, there’s no real alternative to markets. Q: What are the key drivers of economic growth? 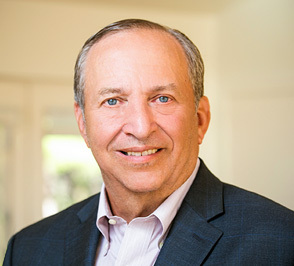 [Prof. Larry H. Summers] Education, health, innovation and entrepreneurship are core to economic progress, it’s hard to imagine people who are sick making rapid progress! Without knowledge it’s difficult to produce anywhere near the cutting edge in today’s global economy. Successful countries, like successful companies are those which encourage initiative and innovation. Q: What are the key problems with modern-capitalism? [Edmund Phelps] I think there are some very worrying developments. If we start with demographics- we have the huge wave of retirement coming up in the next ten years. The United States will be, to an appreciable extent- much more than before- a country of older people. These people will be drawing on retirement and medical benefits. More than that, they will be withdrawing their labour services from the economy, and they’re not being replaced by a new-wave of young people coming up. Capital is going to find itself with less labour to work with so I’m afraid business investment activity is going to be weak ten years from now… and is weak already in anticipation of that. The decade beginning around 2020 will not be a good time for capitalism. Next, if we turn to innovation. there’s been a tremendous slow-down in productivity, beginning in the 1970’s. Economists all knew about that- many wrote about it. As recently as the late 1990’s I realised that the slow-downs of productivity had a lot to do with the rise of unemployment. I had thought, until then, that it was just bad-economics… that some people were just too feeble-minded to separate the level of economic activity from the growth of the output produced by the economic activity. It turns out the man on the street was right, and I was wrong… there is a very close link between productivity growth and unemployment. Primarily, the massive productivity slow-down in Europe accounts for the fact that the German unemployment rate barely budged from 0.8% from around 1960 to 1973. And now? it’s around 8%. A spectacular rise in unemployment…. So why has productivity slowed down? I think there has been an underlying decline in the rate of innovation in the economy. There’s not as much tinkering… not as much dreaming… not as much conceiving new-ways to do things… If we go a level below this and look at the cause of that. We see that a huge amount of short-termism which has crept into the system. CEOs routinely devote their lives to hitting the next quarterly earnings targets… and that doesn’t leave very much time for thinking about the medium term future. This creates a number of mysterious questions. Taking Silicon Valley, which is so famous and so admired… why didn’t all those venture-capital firms multiply and sweep through the world? You have a small number a small number of venture-capital firms which tend to operate in Shanghai and other places, but you have not had an explosion of venture capital… There are a lot of very worrisome questions about what has happened to the dynamism of modern economies such as Britain, America, France and Germany. We did, of course, have the internet revolution… but that too was in just a pretty small sector of the economy. I’m worried that a lot of that innovation is not very job-creating… and to the extent that it is also job-creating, those jobs can be done perfectly well by production workers in China… maybe it doesn’t need the loving attention of craftsmen (for example). Q: Are there any specific areas of additional dynamism needed in our economies? [Edmund Phelps] I don’t think there was ever a specific need for dynamism… Dynamism is the elixir of life. We need to have new challenges! We need to have new ideas! If we don’t have new ideas, and we don’t the opportunity to work on ideas, develop them, test them, try them out in the market, use them, take them home…. if we don’t have that, we’re going to be zombies. I think this is a very serious thing. I’m not saying that there’s some problem out there which means that some particular innovation is needed for an un-met need… although a cure for cancer would be nice. The NIH actually undertook to do this, around twenty or thirty years ago, and it was an amazing thing- around a year ago- when they made a public statement confessing to failure. They confessed that they had been unable to do it. Q: What is the impact of economic stagnation? [Prof. Larry H. Summers] We need to take a broad perspective. Economic growth this year (2015) is almost certainly due to exceed 3 per cent, that’s the rate at which the global economy doubles in a generation. That’s a growth rate 10-100x more rapid than has been observed through most of human history. None of that is to minimise our problems, but rather than to show the fact that we live in a world where growth is taken for granted; and that is not in the normal historical condition of man. Stagnation in the industrialised world has many reasons, there are serious issues of demography- with populations ageing and sub-zero replacement (fertility). There are real-issues of shortfalls of demand that lead to shortfalls in hiring, and shortfalls in investment. There are important issues in areas such as Japan and Europe, where barriers exist to economic dynamism and entrepreneurship. The challenge of maintaining growth that is sustainable and strong appears particularly pressing right-now in much of the developing world, with real issues around governance in countries like Brazil and Russia. China is facing challenges after years of remarkable growth, and the weaker industrial-world economy puts further pressure on them. Q: Are we facing a “new-normal”? What can we do to secure our economic future? Sure, we can do some things that would be good to do in response… It would be good to get rid of this short-termism… some of which is coming from the financial sector. These financial guys are putting a lot of pressure on the CEO’s to be short-termist… to deliver short-term results. We do need a reform of the financial sector, and we do need more ways of nurturing venture capital. I’ve been advocating a first-national bank of innovation. America is a country that has subsidies for almost everything…. education, farming… and hidden subsidies for manufacturing and exporting… you name it! There is very little subsidy, however, for work – and almost no subsidy for innovation. There is a tax-credit and some tax-deductibility for research and development expenditures, but research and development expenditures are confined to a small number of industries- and that’s not a huge amount of money. We have to make it easier for a young entrepreneur to start a company… to start his innovative project. We have to make it easier for an established company to start a new innovative project. I know there are a lot of scientists out there who say, “you dummies out there in economics, you don’t realise that science is the fountain of all progress… and we’d have more technical progress if we had more scientific activity…” and then of course, the green people say, “…yes, we ought to set-up national institutes for reduction of carbon-use, solar, and so forth…”. The trouble is… those science projects will not create a lot of jobs for ordinary people. It may create some jobs for scientists and engineers… We’re not going to get back to the dawning of the modern age from 1815 to 1870, where everybody and his brother was running around trying new ideas…. we’re not going to get there by having some grants for research projects. We have to get back to our roots… get back to the old spirit of experimenting, exploring, trying things out, discovery… on a broad scale. Every company would, ideally, be doing a lot of this all the time. Q: What should be the role of government as it relates to the economy? [Prof. Larry H. Summers] Governments have a basic role in providing public-goods, those goods from which everyone benefits, but where only a small fraction of those benefits are received by the provider. Examples include national defence to basic research and environmental protection. Governments have a crucial role to ensuring fairness; to ensure every child have a chance, and that those with a chance get the education and healthcare they need, to ensure that revenues for state-functions are collected based on ability to pay rather than neglected because of political power… Governments have a crucial role in establishing a framework in which capitalism can operate. They must prevent and, where necessary, regulate monopoly. They must establish framework for property and contract rights, and a structure in which markets can operate. Q: What are your thoughts on the role of government in inspiring ideas (for example, using the space programme and lunar missions)? [Edmund Phelps] The programme to go to the moon and explore space was a wonderful expression of modernism… but I’m afraid it would be disastrous if we made that a recipe to be used all-over the economy… we wouldn’t want the whole economy to be under the direction of a bunch of NASA’s. This has to be at a grass-roots level…. I think Buzz-Aldrin was right that the lunar missions were inspiring… they intended to be inspiring… but maybe it’s a mark of the change in our times, that nobody even thinks of proposing something new like that, they don’t care anymore. Q: What have been the benefits of, and challenges brought by, capitalism? Modern capitalism ought not to be viewed as merely a system for producing goods (more or less the same goods that had been produced during the mercantile period). It was a system that stimulated the production of new commercial ideas- and stimulated the development of those new commercial ideas by entrepreneurs. It also stimulated the development of a crude financial system- that lent some support to entrepreneurial activity- and this system led many producers to spend time or hire people with expertise in evaluating new products and new methods of production. Consumers also came to have a new way of life! Consumers would go to the mall on Saturday morning to look at the new stuff on display! More generally, though, western society went from a life in which ordinary people were not much involved in the economy, to one where people were engaged in conceiving new ideas, experimenting, tinkering, exploring new possibilities, experiencing the ‘new’ – this was an intellectual revolution. I like to amuse myself by pointing out that the arts changed alongside. Music became completely different two or three times after 1815- the visual arts such as painting followed the same trend. Modern capitalism offered a new way of life, not just a higher standard of living. The downside? Well.. of course there’s always a downside to everything. Modern capitalism is a system in which some people are very lucky- they just happen to be at the right place at the right time… and can cash in big-time; while other people aren’t! Some people are very unlucky- they make decisions which turn-out to be ill-fated. That could, of course, have been true to some extent in mercantile times also. With the transformation of capitalism from mercantile to ‘innovational’, however, there was a tremendous increase in uncertainty. The future became anyone’s guess… In that sort of a world, you can find yourself on a very bad path- or you can find yourself on a marvellous path which you had never dreamed of! So there’s just naturally a considerable amount of inequality that this system generates. Q: Why do poverty and inequality exist on such a large scale? That will, of course, leave the Bill Gates’ of the world who are very rich because, besides being very bright and driven, they got extraordinarily lucky. Wealth inequality of that sort doesn’t cause me concern- It doesn’t matter to me that the Rockefeller’s may own half of Maine (for example) or that Ted Turner may own half of Montana… What does it matter? I think Ted Turner did a great thing with CNN and he’s very rich! so what? I just don’t get it. I just never understood why there was such an aesthetic revulsion to outsized rewards for people who had a big idea and- generally speaking- worked their heads off to develop that idea. I don’t have any problem with it. I understand, though, that some very rich people use their wealth to get involved in politics- and I find that a little bit ugly. It’s important to say that this is on the ‘left’ and the ‘right’ – there are plenty of leftist billionaires, and even more right-wing billionaires around. [Prof. Larry Summers] On a global scale, inequality has declined more rapidly than ever in human history over the last several decades, as China and India- which together comprise around one third of our global population, have converged towards the industrialised world. It is markets, markets for export, markets for foreign investment, markets that promote the flow of capital, that have made that possible internationally; and it has been the increasing adoption of markets, rather than command and control domestically, that has explained China’s take-off since 1979 and India’s take-off over the last generation. The story of economic development used to be one of divergence, with the rich-countries pulling away from the poorer countries. Increasingly today, it is convergence and the adoption of market systems has a great deal to do with that. To say that markets work better than command and control is not in any-way to endorse laissez-faire or simply leaving markets unregulated and un-supplemented. Even as inequality across countries has gone down, inequality within countries in many cases has gone up, and that makes a strong case for policies which make taxes more progressive, and to make fundamental public investments; particularly in education and health, that give everyone a chance to succeed. Q: What do you feel is the social context of capitalism? [Edmund Phelps] I think modern-capitalism has given a huge breadth of people a range of opportunities that could not have been imagined in 1750 or earlier. Ordinary people have opportunities (at least in the more capitalist economies of the western world) for meaningful careers- careers of problem solving, venturing into the unknown- and in the course of that not only experiencing the development of their capabilities but also self-discovery- discovering who they are. More than that… it’s about having an adventure that leads them to become something that they didn’t know they could be… to become something way beyond what they could have been had they not taken that adventure. This development is not something you can do on an island alone (although even Robinson Crusoe could come out of his journey almost disbelieving what he had been able to do!) … The social-interactions are an important part of this. The interactions you have with other people lead you to become a different person. A person you could not have become had you not had them. Money culture has really taken-over to excess… In the nineteenth century, people were on a tremendous adventure. They didn’t know what the future held. They were meshed in a colossal discovery process which was enormously exciting! Now it seems that people are in business just to make money. They want to take the adventure out of everything, they want to mechanise things as much as possible… they want to take the business of making mortgage loans to home-buyers, for example, and turn that into some sort of standardised packaging… so that nobody ever sees the home-buyer or even the house… people just enter a code into a system and get the terms of a loan. Q: What do you feel is the relationship between capitalism and conflicts (such as the Arab Spring)? [Edmund Phelps] As I see it… and I feel pretty-sure after talking with experts, that I’m right about this… The revolt of the urban youth in Tunisia and Egypt is all about wanting to have careers… wanting the ability to start your own business… wanting the ability to enter an existing enterprise without benefit of connections (i.e. solely on your CV to date and the people you or your family know). I think Egypt and Tunisia were examples of yet-another economic system… namely the system which, for a lack of a better word, we call ‘Corporatism’. This system has private ownership… one of the things that Egypt did, for example, in the last ten or fifteen years was privatise a lot of enterprises. Those enterprises became owned by people in the military. Corporatism doesn’t mean social-ownership… that’s socialism. Corporatism means that there is a great deal of central control, directed by the government, of the private sector. A great deal of regulation… a great deal of two-way communication occurs with the private sector seeking favours from the government and the government seeking the same from the private sector…. In Egypt and Tunisia, you had a very rudimentary corporatist system which was being exploited all-out by the rulers who took advantage of their powers to put their cronies in place as managers and owners of various enterprises. The bulk of the population, many of whom who- by this time- have college or university degrees of some sort.. cannot break into the system! They can’t get jobs in those enterprises.. they are strictly for the insiders. They can’t even sell their fruits on the streets without a license- and there aren’t very many of those [licenses] distributed. It’s a very closed system… a system that’s about as far from modern capitalism as you can get! Well functioning modern capitalism allows anybody to start-up a company, to go into business for himself, and start coming up with new ideas, and working on their development. In the European corporatist model, you have giant employer-federations and you have giant labour-unions… and so you have a tri-partite system of economic power. In Tunisia and Egypt I think it’s fair to say that the labour-leg of the tripod isn’t there. It’s just the businesses and the government. Big corporations are highly politicized and have close relations with their national governments… Corporatism has always been around… there were certainly corporatist strains in Bismarck’s capitalism. The government was pretty-cosy with a lot of big companies. Companies were going in and out of government offices trying to get contracts, trying to get favours. [Prof. Larry H. Summers] It’s very tempting to suggest that terrorism is caused by poverty. I hate terrorism, and I hate poverty, but my reading of the evidence suggests that they are less closely tied together than many suppose. Those on the planes on 9/11 were highly educated and had cosmopolitan, international experiences. Most of the studies of terrorism find that it has more to do with disillusionment on the part of those who do not feel themselves fully part of progress at moments when rapid progress is underway- rather than it coming from people who are simply frustrated at being poor. The phrase, “revolution of rising expectations…” is often historically apt. Europe was flourishing in an economic sense, in June 1914, and it was at war by August of that year. There are plenty of good arguments for economic growth, and for markets, but I think it’s somewhat naïve immediate and direct linkages with terrorism! As my Harvard colleague Steven Pinker has emphasised, deaths due to violence have been on a long-term downward trend for thousands of years, hundreds of years, and for the last several decades. While the causes are complex, the greater sense of human enlightenment, empathy and connection that is present in the modern world, have to be an important part of the story – and that is surely related to what capitalism has brought. Q: Is there a relationship between Oil and the well-being of economies? [Edmund Phelps] This is a question which has been debated for a long time… You certainly can see that in some countries in the Middle East (excluding North Africa) that the government acquires the ownership and possession of the oil- and then uses the oil to spread money around the country… not only to keep itself in power, and prevent political competition- creating an absence of new ideas, new energy and so forth… but also the whole population can live off these stipends, subventions, emoluments… this flow of money that comes to them without having to lift a finger. This is tremendously damaging to whatever curiosity, drive and zeal the individuals were presumably born with.. and becomes very damaging to these economies. It’s very dangerous to generalise though. If you look at Norway, for example, it’s done a pretty good job of not throwing-around the oil wealth in a way that would be a ‘death-knell’ to society. They recognise that oil will not last forever, and place their oil revenues into a sovereign wealth fund. Then, of course, you have to determine what you do with the income from the sovereign wealth-fund! The returns on sovereign wealth can, of course, be used for various purposes to better society. Maybe Norway is saved by the fact that their oil-wealth is not so colossal that it puts the whole rest of the advanced economy in the shadow- so that it doesn’t matter anymore. Maybe also good sense and propriety combined with prudence and abstemiousness… avoiding ‘blowing’ all that money day by day has also contributed. Q: Has globalisation and the advent of multi-nationals impinged on competition and innovation? [Edmund Phelps] Is the pharmaceutical industry more nearly-monopolised or more nearly under the control of a small oligopoly now that many companies have become globalised? It seems the case in pharmaceuticals that they have all become globalised- so they all compete with one another as before, but they’re all global now- rather than national. I would suppose that there’s more competition now of American pharmaceuticals, for example, with pharmaceuticals in Switzerland and Germany and so forth- than there was in the 1920’s or the 1890’s! A large company now has to answer to a whole-lot of governments whereas previously it only had to answer to one- or one central government, one state government and one local government. That’s not only a distraction, but introduces significant red tape (getting permissions from a number of governments for example). Q: What is the future of economics as a discipline? [Edmund Phelps] Economics is in a tremendous crisis… especially since it doesn’t know it’s in a crisis. This may sound funny… but it didn’t damage me (personally). I spent most of my career trying to put people back into economics! The day I won the Nobel prize, I was asked at a press-conference to encapsulate my life’s research in one sentence. I said, “…in my work, I’ve tried to put the people back into economic theory…” Some of my earliest work looks at a farmer considering new seeds and fertilisers… contemplating whether or not he can take the risk of trying any of these new things…. and whether he should adopt them. The answer depends on his educational background…. his willingness to bear some uncertainty… and so forth. Later on, when I was working on unemployment and inflation- I asked myself… What would I do if I was a company? I realised I would be worried about what other companies were doing about their wages! In the process of increasing their wages, to the extent that they are, I must increase mine too in anticipation. I then introduced wage-expectations and price-expectations which were not talked about before. Later on, around 2000- I started talking about the visions of entrepreneurs… those are real life people who have visions! People who from any walk of life can have an idea…. A truly modern economy is all about ideas and people! Economics has contributed to the march away from these principles by reducing economies to ‘stochastic steady-state models’ in which prices are the entire interest. Prices, in these models, ‘vibrate’ in some way. I find this incredible…. This thinking began seeping into the financial sector so then the banks started importing French mathematicians to work out how to price various assets as if anyone could possibly know what these assets are worth? We live in an uncertain world… not just a vibrating one! Economics will (and should) always have a scientific side… but it has to remember that no piece of evidence is ever decisive on its own… we have to understand that our subject is human creativity. That will be a very different kind of science from what we have had before. There hardly is any science of creativity yet- yet alone a science of individual or societal creativity which understands the interactions of people- that’s the next giant-step.